QuickWiper is a disk and file wipe utility. 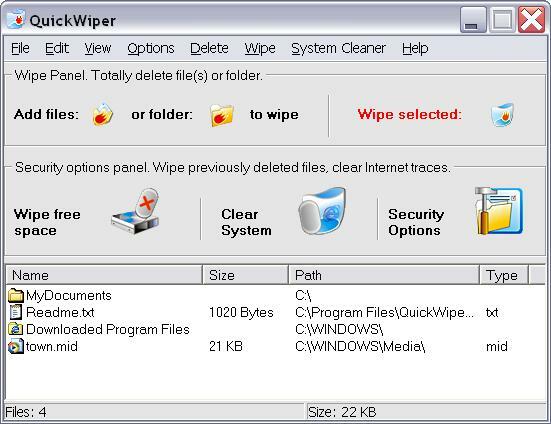 QuickWiper allows to wipe files in handy manner. Wiping free disk space option protects all the files you ever delete before beginning using QuickWiper. System Clearer clears in one-click cookies and history, IE cache and typed URLs, temporary and recent files. With Command line support QuickWiper can be integrated with other programs. Hidden wiping is also available. ...... secure NSA erasure algorithm. Using QuickWiper you can decide whether you want to wipe file names. Command line support. QuickWiper has build-in options to support a command line usage. - You can create a list of files, then send it to QuickWiper and do wiping operation. - You can configure QuickWiper to wipe some files or folder on keystroke. Qweas is providing links to QuickWiper 7.8 as a courtesy, and makes no representations regarding QuickWiper or any other applications or any information related thereto. Any questions, complaints or claims regarding this application QuickWiper 7.8 must be directed to the appropriate software vendor. You may click the publisher link of QuickWiper on the top of this page to get more details about the vendor.